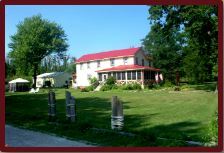 This vintage Pelee Island accommodations is on the southeast shore of Pelee Island, it is set in a unique country setting just a pebbles throw to the beach. It’s perfect for a romantic getaway or a cozy overnight stay with a loved one, while enjoying the serenity of Pelee Island. We offer an adult only atmosphere, asking that children be nineteen years and older. Start your morning by watching the most amazing sunrise, just seconds from the Inn. 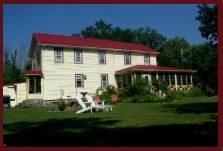 The Inn offers accommodations from quaint rooms with shared baths to private rooms with en-suite bathrooms, your own heating and cooling; along with a screened veranda, furnished with your own hammock and bar fridge.Join other guests as they mingle in the many relaxing areas on the inn’s grounds. Have a wonderful glass of Pelee Island wine in our outdoor jacuzzi or simply relax in our screened gazebo, while watching the many species of birds that make Pelee Island their home.